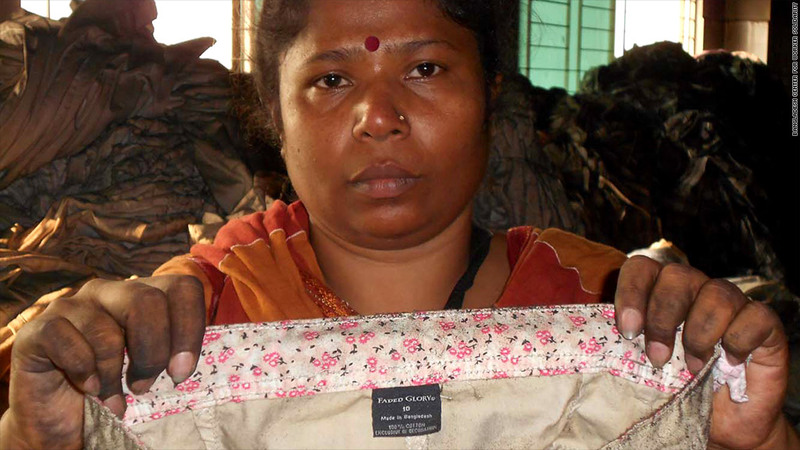 Kalpona Akter, executive director of the Bangladesh Center for Worker Solidarity, shows shorts made for a Wal-Mart brand found in the ashes of the Tazreen Fashions factory, which burned in November. The whole world is outraged over the deadly Bangladesh building collapse, but U.S. companies are dragging their feet when it comes to changing safety protocols. On Monday, six major companies -- representing some of the largest purchasers of clothes from Bangladesh -- signed on to fund a five-year, legally binding agreement that would improve factory conditions in the country. By Tuesday, four more had joined: Benetton, Mango, Marks & Spencer, El Corte Inglés and Loblaw (Joe Fresh's Canadian parent company). The agreement calls for independent safety inspections and for companies to publicly report the findings. It also requires retailers to help finance fire safety and building improvements in factories they work with. Companies have to pay up to $500,000 per year, but some have already pledged up to $6.5 million. Of the eleven companies that have made the commitment, only one -- PVH, which owns Calvin Klein and Tommy Hilfiger -- is based in the United States. Companies that source goods from Bangladesh have been under immense pressure after more than 1,100 people were killed when a factory collapsed three weeks ago. The call to take action is particularly loud for European companies. Earlier this month, the European Union threatened to limit Bangladesh's duty-free trade access if it doesn't make factories safer. American retailers haven't seen that kind of push from the U.S. government. A Wal-Mart (WMT) spokesman said the world's largest retailer had nothing to announce. Sears (SHLD) said it is "assessing" the agreement and will decide "whether this is the best opportunity...to work collaboratively with other industry groups and retailers on addressing safety standards in Bangladesh." Bill Chandler, a Gap (GPS) spokesman, said the company is ready to sign onto the agreement, but only if it changes how disputes are resolved in court. Gap's proposed change to the agreement states that if a company violates the safety standards, they would only be penalized by being kicked out of the accord. One lawmaker is trying to urge U.S. companies and Congress to take action. George Miller, a democratic congressman from California, will speak on the House floor Wednesday morning to encourage lawmakers and the Obama administration to ramp up pressure on U.S. retailers. "They're risking their good will with American consumers," he said in an interview with CNNMoney. "[Shoppers are] telling us in every way that they don't believe the low prices of the garments they buy should be subsidized by young women dying on the job." Brand experts agree. Retail consultant Burt Flickinger said companies will face consumer backlash, but their concern over the bottom line is holding them back. "Apparel retailers don't have enough of a corporate conscience," he said. "They feel guilty about what's happened, but they're concerned about their competition, cash flow and raising dividends for stockholders." Flickinger said retailers pinching pennies look at this as an expense, when they should look at it as an investment. "Workers at those factories have tremendous, unique skills in terms of producing high-quality garments in a highly efficient and productive way." he said. "By ignoring the problem, they will end up paying more." Companies have been drawn to Bangladesh over the years because of its low production cost and high quality. The average worker in the garment industry in Bangladesh makes between 10 and 30 cents an hour. But the recent building collapse and two earlier fatal fires in November show that cutting costs often goes hand-in-hand with unsafe working conditions, like no fire escapes and locked emergency exits.